Although, the slump cone test is not entirely satisfactory since it gives widely varying results and also does not give a true measure of workability but it is of value in the field as a control test and is useful in comparing the consistence of successive batches of concrete made with the same ingredients and is one of the simplest tests to carry out. Provided no change is made in the aggregate or its grading, slump cone tests will indicate whether correct water and cement contents are being maintained. For a given slump and aggregate grading, the water required for unit volume of concrete is constant irrespective of the change of cement content. The amount of slump depends not only on the amount of water in the mix but also on the nature of the aggregate ; rounded stones give a greater slump than angular stones for the same mixture. 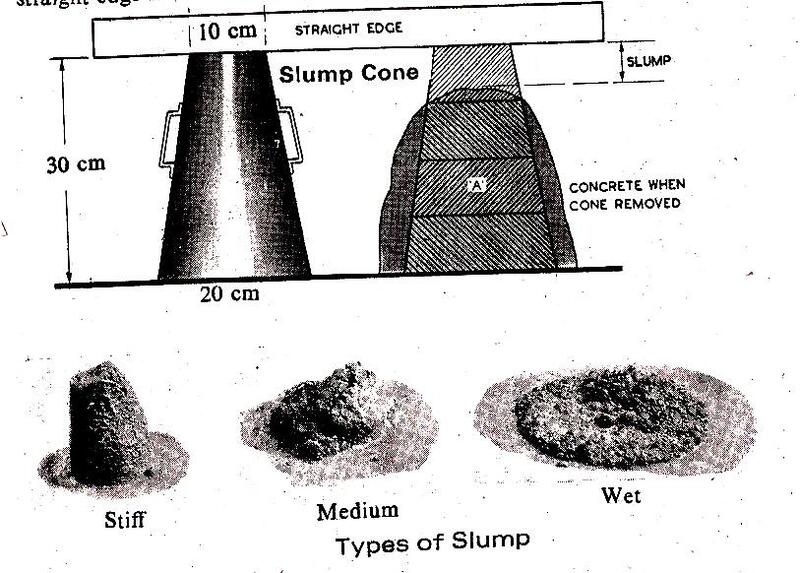 The slump cone test should not be used to compare mixes of different proportions or of different types of aggregates. This test is not applicable to lean dry mixes where the water/cement ratio is low as the slump recorded is very small. All aggregates of size 50 mm and above should be removed from the sample concrete before the test. The apparatus for determining the stump (slump cone) is a steel mould in the form of a truncated cone. Its top diameter is 10cm, the bottom diameter 20 cm, and the height 30 cm, open at both ends and fitted with handles and foot pieces on sides. The cone is placed on a smooth non absorbent surface and freshly mixed concrete is placed in the mould in four successive layers, each layer being rodded 25 times with a bullet-pointed rod 16 mm in diameter and 60 cm long. When tilled to top (after ramming) and top struck level, the mould is immediately with drawn and the slump or subsidence of the concrete measured from a straight edge held across the top of the mould. “Slump” is the vertical settlement of the concrete after the mould has been withdrawn, i.e., the difference between the height of the mould and the highest point of the subsided concrete. A concrete with 0 to 25 mm slump has very low degree of workability, and with 100 to 175 mm slump a high degree of workability which is not normally suitable for vibrations. 1. It is helpful in detecting the difference in water content of different batches of concrete of the same identical mix. 2. The slump cone apparatus is cheap, Convenient to handle, and moreover it is portable. 1. It is not suitable for concrete in which maximum size of the aggregate exceeds 40 mm. 2. There is no direct relationship between the workability and the value of slump. 3. Different shapes of slump may occur and it is difficult to decide which is the correct value. 4. It is not suitable for dry mixes.